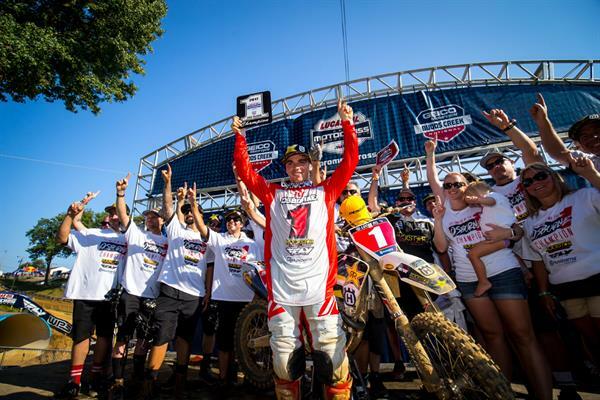 HomeNewsRockstar Energy Husqvarna Factory Racing’s Zach Osborne Clinches 250 Title At Budds Creek! The Rockstar Energy Husqvarna Factory Racing Team headed to Mechanicsville, MD for the penultimate round of the 2017 Pro Motocross Championship and recorded a milestone day after Zach Osborne piloted his Husqvarna FC 250 to 8-1 moto finishes to clinch the 2017 250 Pro Motocross Championship! The title marked a career first for Zach, Husqvarna and his Rockstar Energy Husqvarna Factory Racing Team. Making the day even more special, Budds Creek Raceway, the site of Zach’s debut as a professional and his first career overall victory, sits just under 400 miles from his childhood home allowing for the monumental day to be shared with all his closest friends and family. Osborne got caught up in a first-turn pileup at the start of the first 250 moto. He remounted near the back of the pack, and was up to 26th by the end of the first lap. He rocketed through the pack to make it up to 13th by lap seven, then into the top 10 in lap 10. He continued to push and finished a hard-fought eighth. He was third at the start of the second moto, and had the opportunity to solidify the 250 title with a good finish. He was riding strong in third, then made the pass on Jeremy Martin in the second lap to overtake second. He continued to push and made the pass for the lead in the ninth lap and never looked back. The 8-1 finish gave him second overall on the day, and clinches the title in the 250 class. Congratulations, Zach! Dean Wilson started farther back in the pack in the first 450 moto. He was 15th by the end of the first lap and made passes to get into 12th by lap seven, then 11th in the 13th lap. He continued to move through the pack until he crashed hard after the finish line with two laps to go. He remounted and would eventually finish the race in 16th. He got a top-five start in the second 450 moto and held his ground in fifth by the end of lap two. He made it up to fourth around the halfway mark, then fell back to fifth in lap 10. He stayed consistent the remainder of the moto to finish fifth. The 16-5 finish gave him 10th overall on the day. Davalos was second at the start of the first 450 moto and quickly navigated his Husqvarna FC 450 into the lead. He moved to second by lap four but continued to charge. He went back to third in lap 13 and stayed steady to finish third. He was mid-pack at the start of the second moto and was 10th by the end of the first lap. He was riding consistent in 10th before going down around the halfway mark. The crash left him unable to finish the race, and he went 3-38 for 12th overall on the day. The team will now make its way to the final round of the series, being held next Saturday at the Ironman National in Crawfordsville, Indiana.